Toss: Infosys IMS won the toss and elected to bat. With the monsoon rains just about abating post Ganesh Visarjan, the cricket season is all set to take off in this part of the world. School kids seemed determined as they were put through the paces by their coach at the National Chemical Laboratories Ground in the early hours of the day. The two teams that were to play the game today CECC Pune and Infosys IMS went about with their own preparation running around the outfield where grass was knee-deep across most of the ground. It was decided ahead of the game that should the ball get wedged across the thickest portions of the out field, 2 runs would be declared! And with the 30-yards circle wiped out by rain, it was decided that there would be no field restrictions at all. The coin was flipped and it came down in the favour of Infosys IMS who decided to bad. Mohit and Santhosh opened under overcast conditions. Goutham sent back Mohit in the first over as he tried to clear mid-on and holed out to Suhas who took a one-handed catch. Sachin started with a few extras at the other end, but settled down after a slightly erratic first over. CECC Pune bowlers soon started to weave a web around the IMS batsmen as they played and missed and found run making tough. With the outfield being heavy, it meant boundary scoring was always going to be difficult and would be gold dust through the day. Goutham and Sachin produced a good spell in tandem as they soon reduced to 23 for 4 at the end of 7 overs. Only Tango seemed comfortable as he stuck it out for Infosys IMS. His partners though seemed to be in a hurry in getting off the ground as Gaurav, replacing Sachin, struck in his first over as he had Siddharth hit down mid-off’s throat. 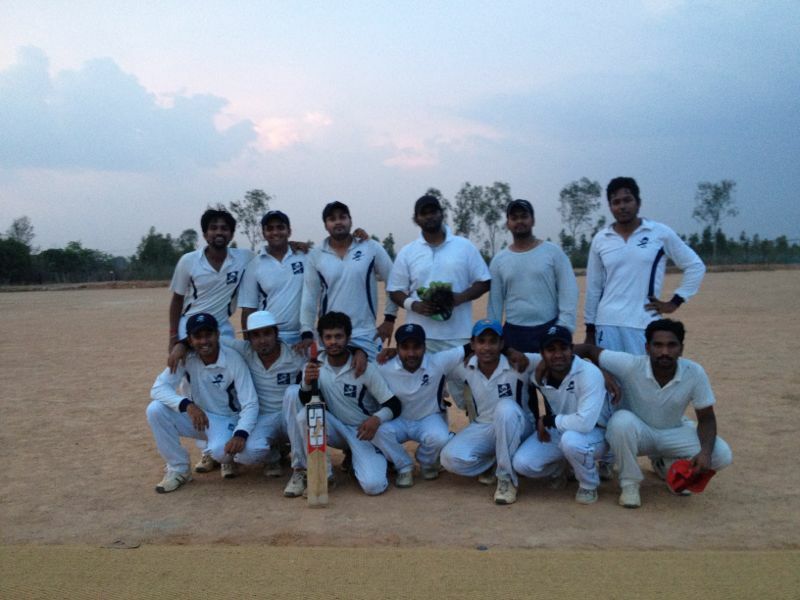 Suhas, replacing Goutham generated good pace and lift from a dead track to have the batsmen hopping about. Gaurav proved an able foil to Suhas as Suhas sliced through the middle order in a good 3-over burst. Gaurav generated equal pace and lift as the pair put on a good show of constant pace having the batsmen in constant distress. Only a flurry of boundaries by Viren right at the fag end for a 20-run 10th wicket partnership pushed the score to 97. 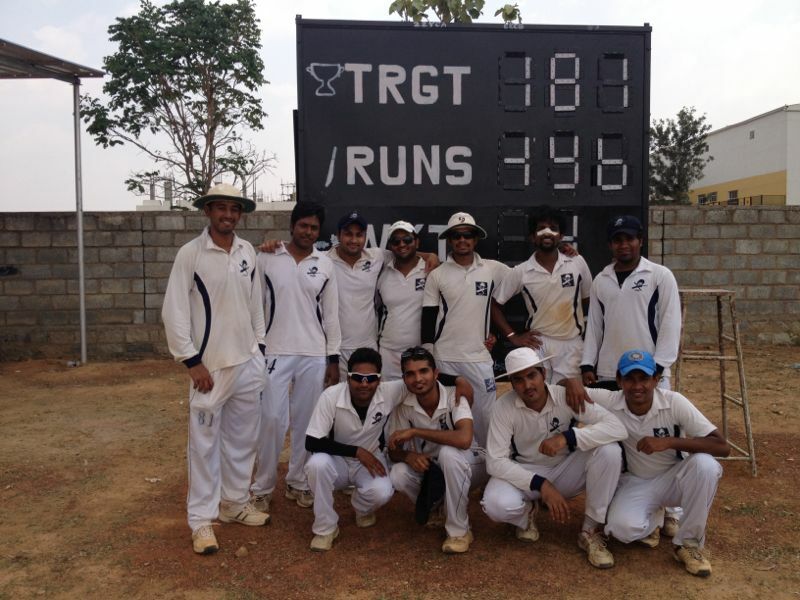 Chasing 98 for a win, CECC Pune lost Goutham in the 3rd over for 6. Rahul at the other end seemed to be in an aggressive mood as he managed to hit a boundary and constantly looked to go over the top. With him, Deepak and captain Yugank falling in quick succession, CECC Pune were reduced to 22 for 4 and had left a buoyed Infosys IMS more than a half chance to claw their way back in. CECC Pune had to address the slide that was a mini collapse and needed to stitch a partnership of sorts to steady the chase. Bowling heroes Sachin and Suhas dug their heels in a hardworking partnership that involved some luck. Suhas though was out in a bizarre fashion 20 minutes into the partnership as he swung and missed at a delivery. Having missed the ball, he then instinctively replayed the drive as he swung his bat to practice his shot and dragged his back foot outside the crease and an alert ‘keeper Ujjwal stumped him. Gokul walked in and with Sachin by now fully at ease they backed up the good work done by the previous partnership as they eased into the bowling with regular singles and the odd two. The pressure that the bowlers had managed to build up till that point now was disappearing as the strike rotated with constant regularity. Slowly, the odd boundary also started to feature in the routine of singles and twos as runs were now being chipped away in chunks. With 20 needed for the win, drinks were called and on resumption both set batsmen, Sachin and Gokul departed as the game took another turn. 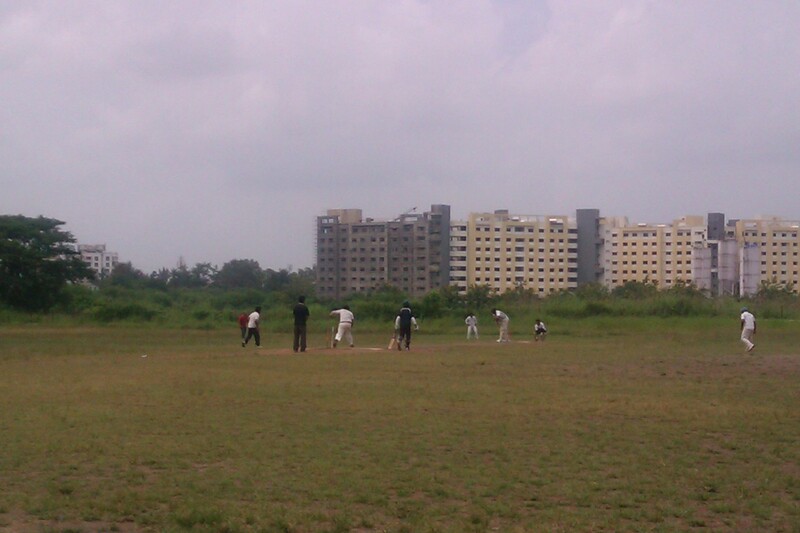 CECC Pune made a heavy weather of the last 10 runs as they lost 4 wickets. With the last pair at the crease, still 3 were needed for the win. And when Pradeep tucked behind square for a 2 to tie the score, the non-striker was pulled up for a short run at the keeper’s end to further heighten the tension. Gaurav though, made up for his mistake by evening the scores off the very first ball of the next over with a single to fine leg. Pradeep finished the game off with a flick to the mid wicket boundary. For a great show with the bat, ball and more so in the field with his 4 catches, Sachin was the performer of the match. 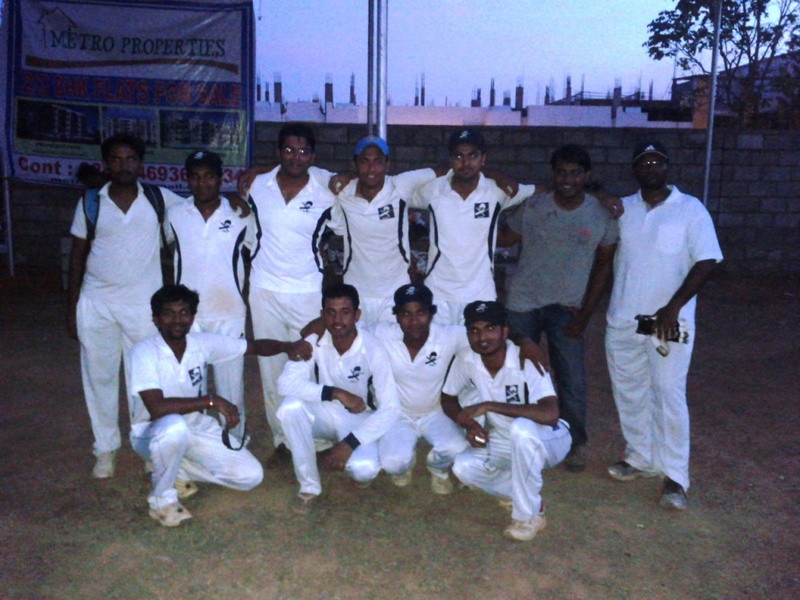 Match Result: CECC beat Infosys IMS by 1 wicket. Toss: CECC won the toss and elected to bat. CECC won the toss and elected to bat under very humid conditions. The new opening pair of Goutham and Muthu though hardly had to sweat much at all as Yahoo!’s new ball pair of Girish and Kavash, though managed prodigious swing, were too short to be effective. As a result, Goutham and Muthu feasted on cuts as they rattled along at 10 an over across the first 4 overs. Disaster struck in the 5th over as another short ball from Girish darted into Muthu whose attempted pull found his gloves before smashing into his nose. He suffered a cut on his nose bridge and retired hurt so as to get it checked for severity of the injury. Jobin joined Goutham and the 50 came up soon after in 5 overs. Goutham though missed a dipping full-toss from leg spinner Nachiketh to be bowled for 25. CECC’s in form batsmen Shoukath and Gautam R though didn’t have a good time with the bat as both were dismissed quite softly. Shoukath drove a half-volley to covers and Gautam lobbed a high full-toss to the square-leg fielder’s waiting hands. Gokul, playing after 6 games, joined Jobin and the pair kept the scoring ticking quickly with aggressive running between-the-wickets with some wonderful drives, punches, pulls and leg-glances. The languid and fluent Gokul with his free and full arm movements is always a delight to the eye with his elegant manner of batting – high back-lift with a full free swing of the arms with the bat often finishing resting on his back. The economy of his late feet movement makes him a very attractive player to watch when his brings out his drives and leg-glances. Jobin, on the other hand, seemed to be getting into his stride for the first time since feet corn cut short his very rich vein of form 2 months ago. Today, though, he seemed to be less stuck in the crease as he moved freely and decisively forward and backwards and found his timing and range on both sides of the wicket. The pair kept the Yahoo! bowlers at bay by looking to go after the bowlers early in the over and managed to tick singles of the remaining deliveries to go at 7 or 8 every over in the middle overs as they set a tremendous launch pad to the big hitters in CECC for later. Jobin perished for a satisfying 48 and soon Gokul perished for a stylish 38. Gaurav and Ashish brought out the big hits in the end to push the CECC total to a more than competitive 180 that would test Yahoo!. Gaurav kept the Yahoo! openers pinned with his quick and accurate off-spin in a testing first spell. His around-the-stumps line meant that the batsmen had to be on the watch out for deliveries that were turning in to crash in to the stumps and the ones that went with the arm and skidded along with the angle towards the slips. He gave Nachiketh a particularly working over repeatedly beating him outside off. He was very unlucky not to pick up any wicket in his very impressive first spell. Goutham kept the batsmen in check with his outswingers. He drew first blood when he had Girish caught at mid-on trying to slog at an outsinger. And when he ran out the captain Kavash in the 9th over Yahoo! were pushed back a long way as the new ball pair had restricted them to 45 for 2 in 9 overs pushing the required run-rate close to 9. The follow-up to the initial burst was a slight mixed bag as Bhargav found it tough to hit a good line and length straightaway. He however followed it up with two tight overs back-to-back. Gautam R too found his stride only after bowling his first over. With the required runrate mounting all along, Pandian played a handsome innings controlling the middle order and also maneuvering the field with his powerful game. CECC’s bowling and fielding wilted under the quality of his batsmanship even as he struggled to find support at the other end. Jobin and Dinesh chipped away at the other end as Kaustubh quite astutely worked to starve Pandian of strike. The strategy worked like a charm as wickets tumbled at the other end and the running-between-the-wickets also became wobbly. As the overs shrank Pandian became more and more restless and his strokeplay became more and more power oriented. CECC’s bowling suffered and consistency in executing their plans eluded them across the length of a full over. The erring in lengths and line kept Yahoo! in hunt as Pandian brought-up his 50. The tide turned eventually as Gautam executed his plan of bowling full to straight fields as Pandian missed a straight and full delivery to be trapped in front. With the danger man gone, Kaustubh brought in the field to make the lower-order batsmen take risks to score runs and the pressure told on the batsmen as they heaved strokes more in hope than in conviction. Chaotic running and stroke selection ensued and they were eventually bowled out 9 runs short with an over still left to play. The grit of the team and its desperation to win came through the game as they backed the bowlers and fielders with a less-than-perfect fielding display, but with full marks for effort and commitment. The working in partnerships in executing plans seemed to be on the upward curve. The grit and putting the team cause above self was best exemplified by Muthu. After suffering a cut on his nose and having the wound cleaned and the nose bridge put back into shape, he came back to keep the wickets (later operated and now in splints). He stood up to the stumps to the medium-pacers, marshalled fielding troops and kept the spirits of the entire team up with a bloodied nose. And yes, he swallowed the two chances that came his way too. On a humid afternoon Kaustubh won the toss and elected to bat first. Goutham got CECC off to another quick start scoring 26 off the first 3 overs before falling in the 4th over. 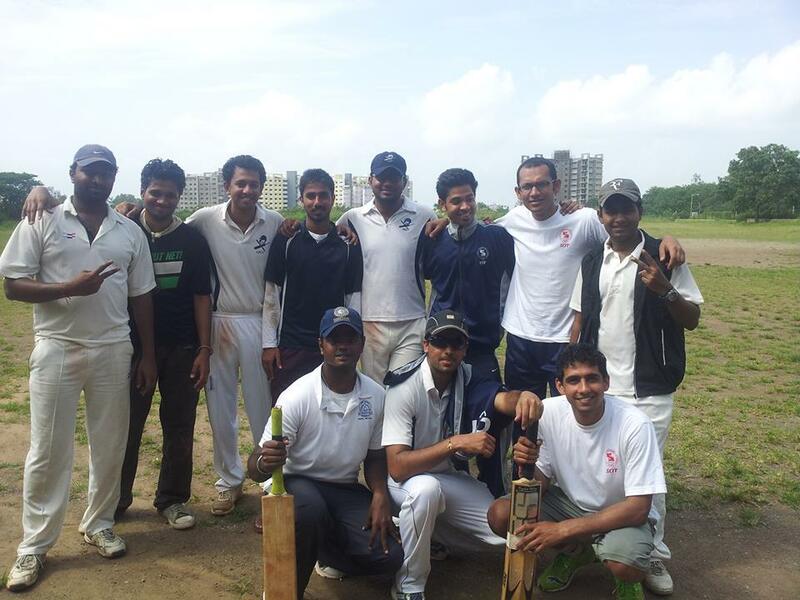 Jobin and Kaustubh looked to stabilize the innings before both perished to leading edges. Bhargav continued his good form with the bat from the last game as he got stuck into GE’s bowling. Shoukath provided tremendous support as both scrambled quick singles and twos on a hot afternoon. Bhargav was adventurous in his strokeplay, often exposing his stumps and going over the off-side and repeated walking across his stumps to slam the ball to the on. Shoukath, on the other hand, played a measured innings sticking to his powerful drives and ticking the runs with quick ones and twos. The pair put on an entertaining 4th wicket partnership before Vinod trapped Bhargav for 30. GE pulled it back well with tight bowling and tremendous ground fielding as CECC looked to capitalize on Bhargav and Shoukath’s partnership. Shoukath fell for a very well made 48 as the scramble continued for quick runs as Ashish, Gautam, Gaurav, Sameer and Chanakya kept at it. A total of 167/9 in 25 overs was always going to be challenging even considering the firepower GE carried at the top of their order. GE started fortuitously as Bhargav missed running out Manjunath in the first over that went for 5 overthrows. But GE would be rocked badly as their star batsman and captain Rajnikanth fell for a duck 3 balls later. Like in their previous game against HSBC, Gaurav kept a tight leash at the other end with his clever changes in pace and flight. The pressure told at the other end with wickets falling to Goutham. Gaurav continued to haunt GE with his ground fielding as he accounted for GE’s opener Manju as his throw found the stumps at the non-striker’s end. It brought a very scratchy innings of 5 to an end that seemed to throw up a run out opportunity every second ball. The cat had run out of its lives the moment it found the dead-eyed Guarav. Like in the last game, Gautam R and Bhargav backed up the opening pair with tremendous swing bowling. Bhargav generated pace and bounce along with the movement to mesmerize the GE batsmen. Even as he often struggled to control the prodigious swing, Muthu had a great game behind the stumps putting up a masterclass in wicket-keeping. Muthu’s standing-up-to-the-stumps wicket-keeping to the medium-pacers has been an important factor in CECC’s success of late. Especially in the powerplay overs preventing batsmen from leaving the crease. His soft hands and tremendous footwork allow him to stay low and move up and side-ways simultaneously with the ball. His tremendous balance allows him to reach the ball with quick and short side-steps so that he never really has to dive much even for wide deliveries. His tremendous ground coverage ensures that his team rarely suffers wided boundaries or, more importantly, missed chances behind the stumps. His two catches standing up to the stumps off the bowling of Goutham and Gauram R being the standout performance of this game even as GE’s chase continued to go off rails under the pressure put by CECC’s bowling and fielding. The chase folded meekly in the 20th over when the last 3 wickets fell to some poor running between the wickets. CECC was playing its third game in 7 days as they took on HSBC. After winning the toss and electing to bat, Harsha and Goutham looked to go after the HSBC bowling straight away. The pair initially struggled to get used to the pace of the wicket that seemed slow throughout the weekend. Goutham got out in the 5th over driving a full-toss to short cover. Jobin joined Harsha and the pair steadied the ship with a careful partnership. Harsha soon found his range as he found boundaries on both sides of the wicket. Jobin looked to go after the left-arm spin of Kunal and was able to take him repeatedly over mid-wicket and covers. The partnership was steady but in the quest to up the ante, both Harsha and Jobin fell after making 20’s each. With wickets in hand, CECC looked to after HSBC bowlers and lost Ashish and Kaustubh in the process. Yugank came in and was severe on the slow bowlers of HSBC as he raced to 16 when his off-drive was caught inches from the long-off boundary as he threatened to take CECC to 160 and beyond. Bhargav continued the onslaught as CECC continued to scramble for quick runs towards the end. Bhargav’s assault at the end eventually pushing CECC’s total to a competitive 143. CECC’s bowling was very tight in the powerplay overs backed with wonderful fielding. Ankit and Vamsi came out swinging only to find thin air repeatedly against Goutham and Gaurav. Goutham soon accounted for Vamsi and Noor in the same over followed by the wicket of Noor in his next over. Gokul backed-up the opening bowlers with a tremendous spell of quick bowling extracting considerable bounce off the wicket having the HSBC batsmen hobbling. Gautam R and Bargav rounded off a great day for CECC bowlers swinging the ball late and considerably never letting HSBC batsmen off the hook. HSBC eventually wilted against the continuous onslaught of CECC’s bowlers eventually folding up for 118 in the 20th over giving CECC another comfortable win. Toss: Wipro Sharks won the toss and elected to bat. Sharks elected to bat and the openers Praveen and Aseem got off to a brist start as Gaurav struggled with his length unusually. Shoukath replaced Gaurav, but the runs kept coming with CECC being sluggish with lines drifting on to the legs of the batsmen quite often. Sharks’ batting continued to prosper even after losing Praveen as captain Sandeep came in and looked to be aggressive. CECC’s bowling struggled as Gautam and Gokul also were unable to keep a lid on scoring. The tide turned with the introduction of debutant Chanakya who started with off-spin and then bowled 3 nagging overs of stump-to-stump medium pace. The control offered by Chanakya worked in favour of Dinesh with s he produced a memorable spell of quick bowling from the other end. Dinesh repeatedly beat the batsmen with his pace and had them bowled. Sharks however had a good last 3 overs to recover from the middle-order slump to post a formidable total of 154/7 in their 20 overs. 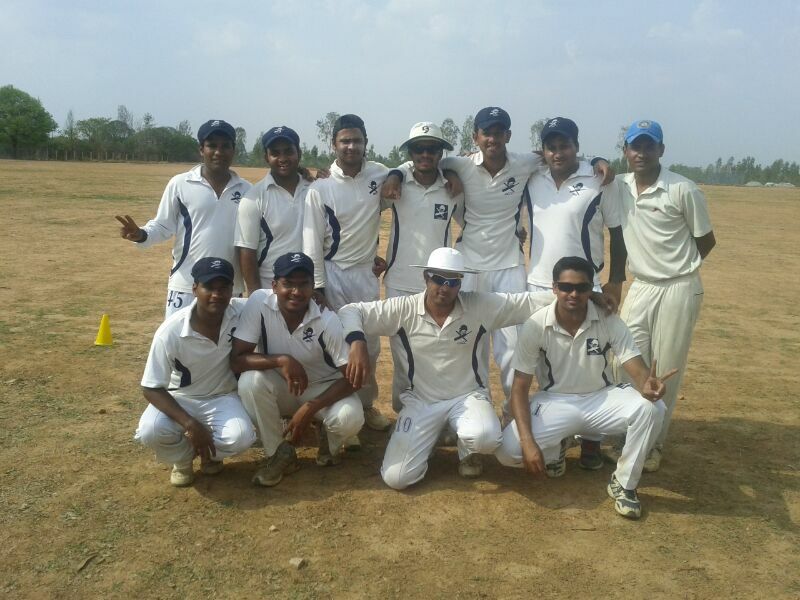 The chase began poorly for CECC as they lost Goutham and Shoukath in the first over as Vinay had them both castled. CECC’s troubles of losing wickets was compounded by not being able to score runs at the required rate. Yugank and Muthu soon perished as opener Gaurav continued to graft will not much success. The introduction of deubutant Gokul LN speeded up the innings for CECC as he provided the much needed momentum with powerful lofted drives to the leg. His quick partnership with Gautam gave CECC the impetus on which they would later mount a tremendous assault before he fell playing across the line for a quick 18. With Sushanth also perishing after Gokul, another debutant Sameer joined Gaurav with close to 9 runs-per-over needed in the last 7 overs. The pair kept at the scoring rate as the Sharks’ bowling wilted under the onslaught. Gautam with his inside-out chips and Sameer with his powerful strokes rapidly chipped away at the target and in the course of 20 minutes and 4 overs changed the tide completely. Even as darkness invaded the ground late in the evening, CECC brought-up its win in the 20th over.